Videos, worksheets, games and activities to help Algebra 2 students learn how to find the equation of a given sine or cosine graph. We have included a tool that with plot the sine graph f(x) = A sin(B(x-h))+ k, given the values A, B, h and k. Use it to check your answers. The following diagram shows how to find the equation of a sine graph. Scroll down the page for examples and solutions. When finding the equation for a trig function, try to identify if it is a sine or cosine graph. 1. Find the amplitude which is half the distance between the maximum and minimum. 2. Find the period of the function which is the horizontal distance for the function to repeat. If the period is more than 2π then B is a fraction; use the formula period = 2π/B to find the exact value. 3. Find any phase shift, h.
How to determine the equation of a sine and cosine graph? Given a transformed graph of sine or cosine, determine a possible equation. Find the equation of the given graph in terms of sine and cosine. How to come up with the equation of a sin/cos function when given the graph? How to Get Equation of a Sine Curve? How to identify the graph of a stretched cosine curve? 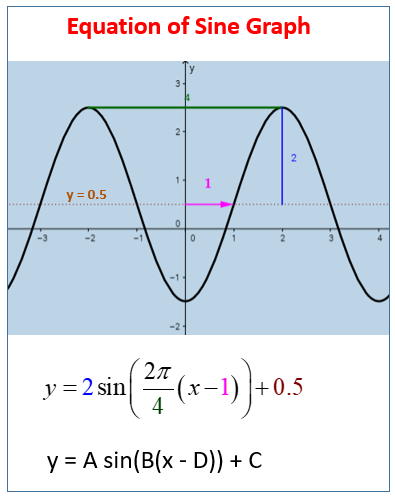 This video demonstrates how to stretch and shrink the sine and cosine curves. Enter in the values for f(x) = Asin(B(x-h))+k into the sine graph calculator to check your answer.